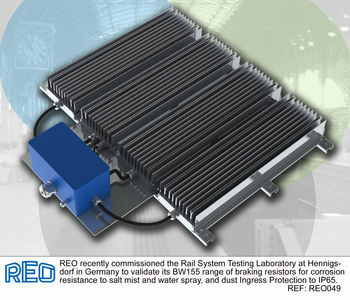 The Rail System Testing Laboratory at Hennigsdorf, Germany has validated REO UK’s BW155 range of braking resistors for corrosion resistance against salt mist and water spray as well as dust Ingress protection to IP65. The specific standards that the resistors were tested to are EN60068-2-52 for salt mist and EN60529 for Ingress Protection. The BW155 range runs from 4-30 kW continuous power, with a typical working voltage of 1kV. Short-term overloads up to 20 times nominal can easily be achieved. Many of REO’s customers operate in extreme environmental conditions where standard electrical items are unsuitable. In order to satisfy these requirements it is not only important for REO to demonstrate that components can be designed for use in these areas, but also that they are externally validated. This is especially important for products which are designed for use in marine, renewable or railway traction applications. To test for ingress of foreign objects, a unit is placed within a sealed room and exposed continuously to fine dust particles for a period of eight hours, after which time it is inspected to ensure that there is no ingress. Similarly, to test against water ingress, the unit is exposed to a 6.3mm diameter water jet for three minutes at a flow rate of 12.5 litres per minute from a distance of three metres. “In both cases, the ingress should be such that the safe and regular working of the equipment is not affected,” advises Steve Hughes, managing director of REO UK. “Once the BW155 unit had passed these tests, it was time for the corrosive test at severity level four, which involves two complete test cycles of exposure to a five percent salt solution. Benefits of the BW155 air- and water-cooled resistors include high functionality, reliability and service life, higher dielectric strength from windings that are spatially separated, and higher mechanical protection. They are not sensitive to moisture and fouling, have low susceptibility to vibrations and oscillations, and have extremely low audible noise levels. Offering fast connection, good heat dissipation and compact dimensions, the BW155 is designed to be easily mounted and its inherent performance benefits mean that it can now be mounted virtually anywhere.